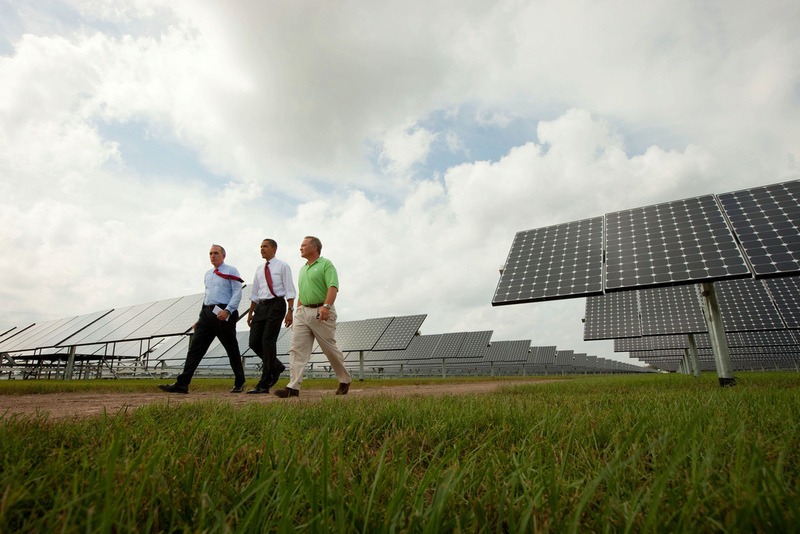 The 45 CEOs represent a cross-section of the US solar industry employing thousands of US workers in 19 states. Companies signing the letter manufacture polysilicon, the key component in solar cell manufacturing; build machinery and equipment used to produce solar cells; develop residential, commercial and utility solar projects and install solar panels. Companies signing the letter are based in Alabama, Arizona, California, Colorado, Connecticut, Florida, Hawaii, Maryland, Missouri, New Hampshire, New Jersey, New York, North Carolina, Oregon, Tennessee, Texas, Vermont, Virginia, and Washington. Among the CEOs signing the letter are those leadign some of the nation’s largest solar manufacturers and installers: AES Solar, MEMC/SunEdison, GT Advanced Technologies, REC Silicon, Rosendin Electric, Sungevity, SunRun Inc., and Swinerton, Inc. The letter with the names of 45 CEOs and their companies is attached. The US solar industry has been a success story to date, especially against a backdrop of historic economic and financial system problems, and the CEOs are clearly concerned that the increasing number of trade disputes between China and the US will bring this to an abrupt end. 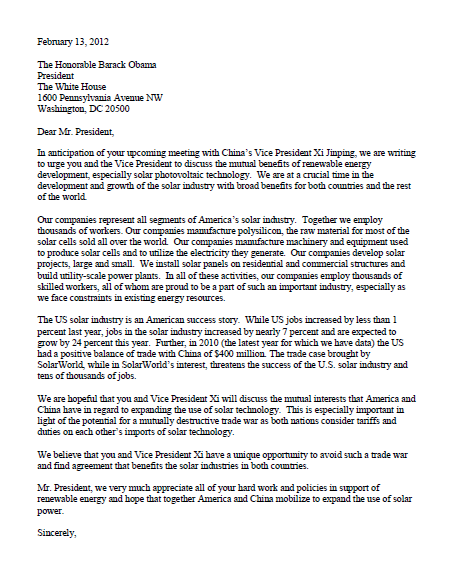 President Obama’s discussions with Vice President Xi are “especially important in light of the potential for a mutually destructive trade war as both nations consider tariffs and duties on each others imports of solar technology,” according to the letter. While US job creation rose less than 1 percent last year, solar energy industry jobs rose 7 percent, and the industry expects that to surge 24 percent in 2012. The US solar energy company CEOs also note that the US had a net $400 million solar energy trade surplus with China in 2010. “We believe that you and Vice President Xi have a unique opportunity to avoid such a trade war and find agreement that benefits the solar industries in both countries. Mr. President, we very much appreciate all of your hard work and policies in support of renewable energy and hope that together America and China mobilize to expand the use of solar power,” the letter concludes. Log in | 77 queries. 1.128 seconds.